We got our garden in the ground the last week of April. The picture doesn't show much, but it's all there! Tomato are in the right two rows in the back and bell peppers in front. 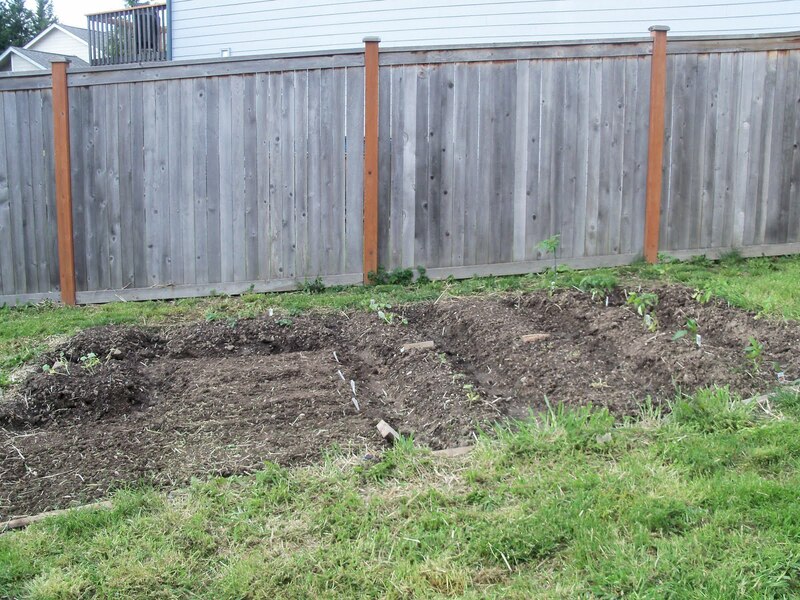 The two rows in the center include beans, broccoli, cucumber, & zucchini. The big flat space to the left of center is all the lettuce and the flat space on the far left, front, are peas & carrots. The mounds in the back left corner are pumkin, giant pumpkin, and strawberries. First we had to get the dirt ready. Last year, our first year of gardening, I gardened with my friend, Ruth. We rented a rototiller from Home Depot and ours husbands did the heavy labor, tilling up the grass and making workable soil. Ruth mixed in some chemical-free glass clippings and steer manure to act as fertilizer. This year our soil was already pretty easy to turn & work, and being resourceful, DH & and I just went out there with shovels and turn it all over. I also bought 5 cubic feet of steer manure to put more nutrition into the soil. Next we headed to the store to buy some plants. I had some good zucchini. pumpkin, & broccoli starts, but that was about it. Note: Don't buy Dollar Store seed packets, even if they say packaged for 2010. We bought 6 tomato plants, 3 bell peppers, a six-pack of strawberries, and 2 cucumbers. At home I plotted out the garden, looking at seed packets to see what needed rows or hills and how far things needed to be spaced. I was proud of my little map! The most interesting thing I noted was that green beans shouldn't be planted in the same place year after year. Ruth had also recommended moving the tomatoes next year because they get so big and ended up shading many other plants that like lots of sun. When I headed outside I started to build up rows into long mounds. I quickly realized the dirt wasn't fine enough for seeds, but would be OK for the established plants with a bit more work. I worked at the soil some more to make it more fine and friendlier for the plants then I transplanted all the store-bought plants and the zucchini and pumpkin I had started. DH continued to work at those sections of the garden intended for seeds, making the dirt more and more fine. Another day I went out and worked those "seed" areas even more, making the soil as fine as I could in the time I had. Then I planted beans, peas, salad greens, spinach, romaine, and carrots. One fun thing we planted were giant pumpkins. The seed package indicates these can grow up to 6 feet across! I'll definitely watch this plant closely and if it starts to go crazy I'll trim it up so only one pumpkin grows. Seriously, what am I going to do with one huge pumpkin, much less more? DH & I just thought it would delight the girls to have a huge pumpkin in the yard. Now that we're out of town Ruth has agreed to come and water the fledging garden for me - Thanks Ruth! I hope these plants feel at home and start to flourish under my not-so-green-thumbed care.